Choose a Bangkok Airport Limousine transfer and be whisked away from Suvarnabhumi Airport in no time. Convenience: The choice of a Bangkok Airport Limousine transfer is very convenient, as you can purchase your trip whilst waiting for your baggage to arrive on the carousel. Once you buy your ticket at the desk the porter will whisk your luggage away. There will be no queuing as the vehicle will be waiting for you out the front of Suvarnabhumi Airport. Safety: As safe as the driver at the wheel of the car. Royal Thai Police background checks are conducted on the driver and all AOT Limousines are fitted with GPS for tracking purposes. Drivers are also trained in English, route and courtesy. 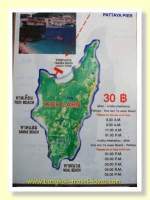 Cost: The cost is by distance and by the type of car you select, but as a guide a sedan car would cost between 1200-1800 Baht depending upon where your hotel is located. If you choose a BMW or Mercedes limousine or 12-seater van then it will cost a little more to take a limousine from Bangkok Airport. Pitfalls: When organising a Bangkok Airport limousine transfer there is very little can go wrong, as the risks of a delayed flight, cancelled flight, missing each other or the booking being forgotten are all eliminated. 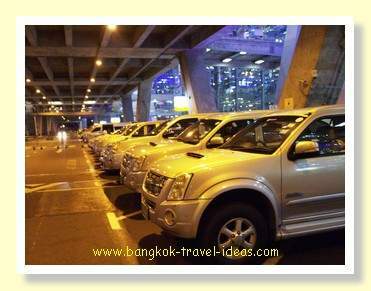 Just book the Bangkok Airport limousine or van when you arrive and probably the only risk is that they don’t have the vehicle that you want in which case you would just choose an alternative vehicle. In my experience they always have plenty of limousines out the front of Suvarnabhumi Airport. 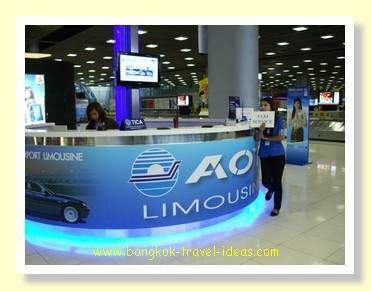 Directions: AOT Limousine ticket counters are located in the baggage arrival hall and also directly after Customs Control. You can purchase your ticket whilst waiting for your bags to arrive at the desk in the baggage hall. After passing through Customs Control, go to the AOT Limousine counter and hand over your receipt or purchase a ticket. Tell them the name of your hotel and prices are looked up on a computer and are not negotiable. They will direct someone to carry your bags to the waiting vehicles. That is all there is to organising a Bangkok Airport Limousine transfer. Return to the overview covering arrivals at Bangkok Airport, or go visit the various Bangkok Districts to check out where to stay. The Suvarnabhumi Airport Link (ARL) opened in 2011 and now provides comfortable and quick transport from Suvarnabhumi International Airport to Bangkok. If your hotel is near to one of the ARL stations, or you are light with luggage, it can be a good option. Find out more information about taking the train from Suvarnabhumi Airport. If you are familiar with Bangkok then hiring a self-drive car is a great way to get you to your hotel or apartment quickly. Read about what you need to know about self-drive car hire in Bangkok? Most visitors to Bangkok Airport choose to take a taxi into Bangkok. Taxi scams are frequently reported and whilst the risk is low there is always the chance that it could happen to you. 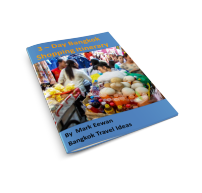 Read about taking a Bangkok taxi from the airport. 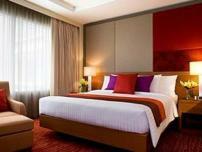 Book your hotel car at the same time as booking your Bangkok hotel. Let the hotel arrange to pick you up in a fancy hotel car, when you arrive at Bangkok Airport. Learn what can go wrong. 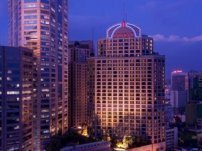 Read about booking a hotel car to take you from Bangkok Airport to a city centre hotel.